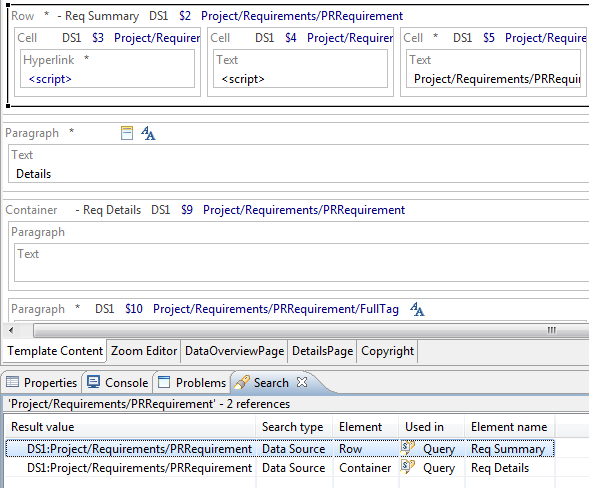 With RPE 1.2 we have added search capabilities to Document Studio and we have expanded these capabilities in RPE 1.2.1. The RPE Infocenter search topics are listed below but in this post I want to provide a quick summary with visual guidelines of the various search capabilities . 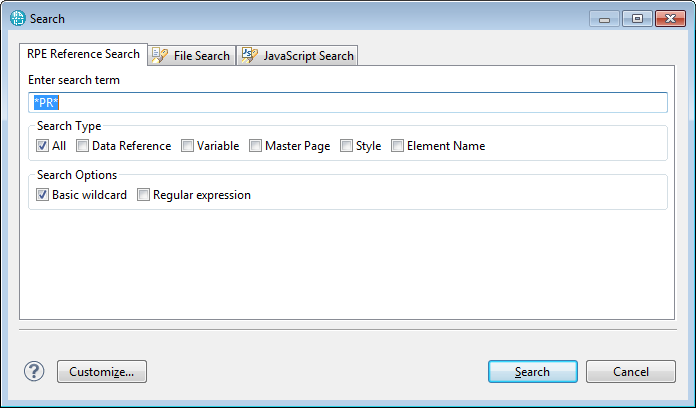 This option is available for variables, master page and styles and can be accessed from Outline’s context menu. 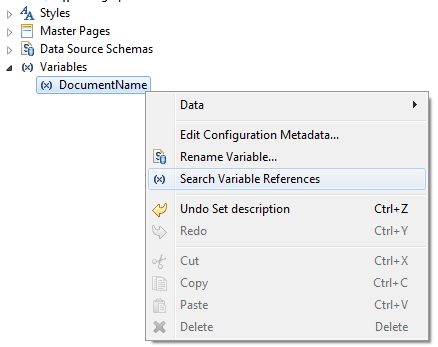 Choosing “Search Variable References” ( or Search Style , Search Master Page etc) will give a list with all the locations where the variable was used. TIP using the Outline View search function is the preferred way for searching where variables/master pages/styles are used. The same functionality is available from the Search menu but requires you to type the search term. The search results will contain where that exact query, in my example Project/Requirements/PRRequirement, is used anywhere in the template. The search results window allow you to visualize the element containing the search occurrence ( click on the result) but unlike most other search results you cannot edit it by double clicking the search result. TIP using the Data Source View search function is the preferred way for searching where queries are used. The same functionality is available from the Search menu but requires you to type the search term. This is the most flexible approach, the method that includes all others. You need to type the search term and specify the search context. 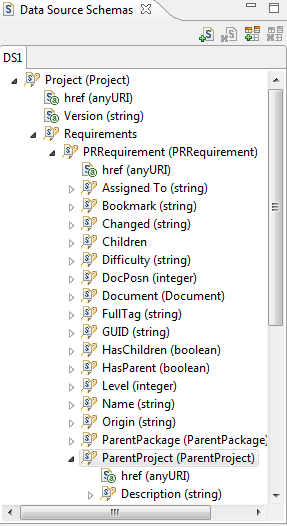 From RPE 1.2.1 there is an “All” context which is a reunion of all the other search contexts. The search term can used the basic wildcard search ( typical meaning for . and *) as well as Regular Expressions. TIP use * before and after the search term to find all the occurrences for that term. 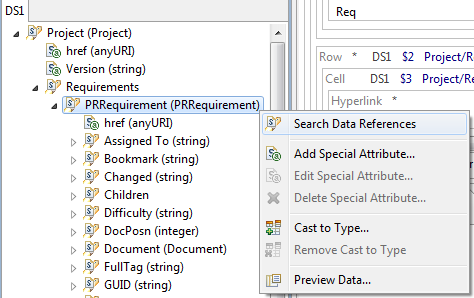 The last search capability is a reverse of the “Search Data References” and is accessible from the editor area. This search allows to locate in schema a query used in the template. This is useful when you have a very long and complex query on an element and you want to add other properties/subqueries from it or you simply want to inspect its structure. 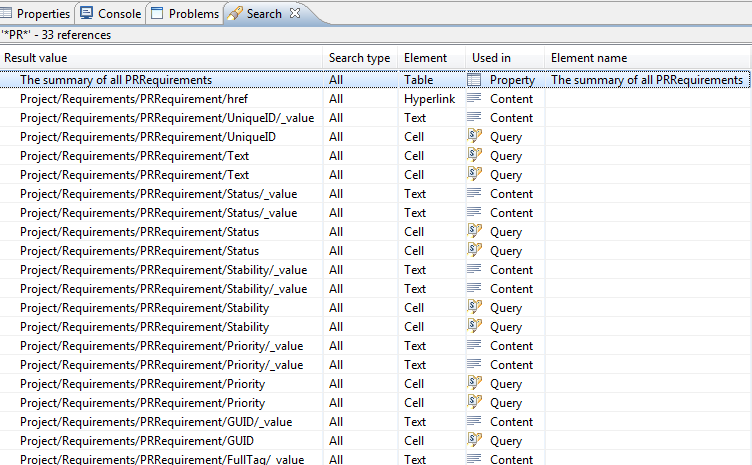 You access it by right clicking on the element holding your query and selecting “Go To Schema” from the ‘Search” menu. The correct node is selected in the schema with all the parent nodes leading to it being automatically expanded. We continue to improve RPE’s search capabilities so if you feel there is a particular scenario which is not yet covered please raise an Enhancement Request through the IBM Software RFE Community.